Google's small class of Chromebooks has been growing slowly but steadily and doubling its US web traffic from 0.1 percent to 0.2 percent in the past half year. Not bad considering the obvious big name alternatives as the unique software and ultra-low prices of Chromebooks have managed to cut a sizable niche for schools and student users. 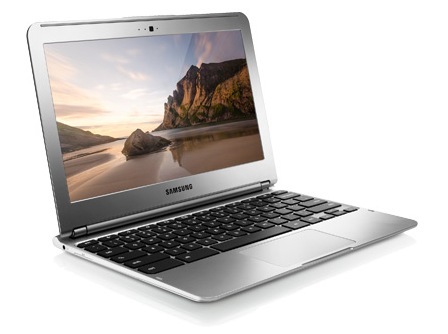 Available since early 2013, the Samsung Series 3 XE303C12 notebook is an 11.6-inch Chromebook running on the manufacturer's in-house dual-core Exynos 5250 ARM SoC with integrated Mali-T604 graphics. The model follows on the footsteps of the 2011 Series 5 500C21 and 2012 Series 5 550C22, but with a lower starting price of just $250 in the U.S.. Specs are thus at the budget level: 2 GB RAM, 16 GB SSD, 768p resolution display and limited connectivity options. 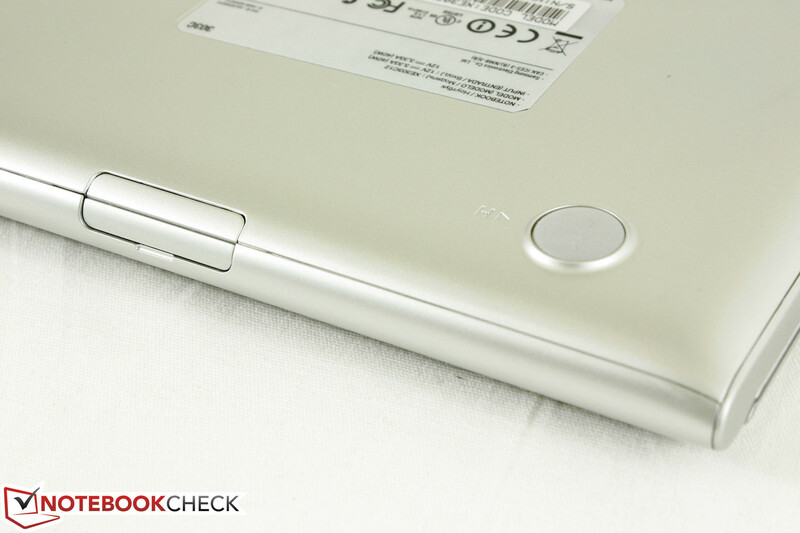 In this quick review, we provide a close look at the hardware abilities of the notebook. For more details on the Chrome OS software and its features, we refer to the our previous reviews on the HP Pavilion 14 Chromebook, HP Chromebook 11, Acer C720 Chromebook, Google Pixel Chromebook and the aforementioned Samsung Chromebooks. 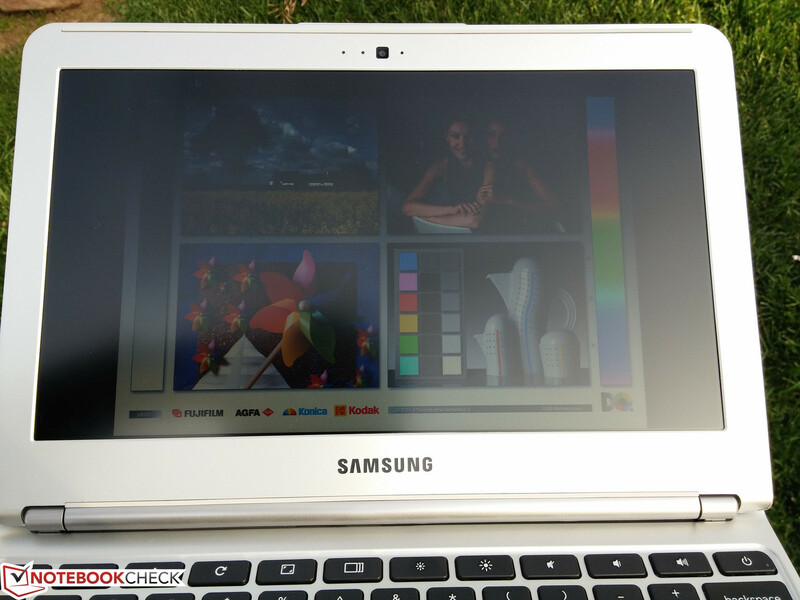 The construction quality of the Samsung Chromebook beckons back to netbooks of old before the rise of tablets and Ultrabooks. 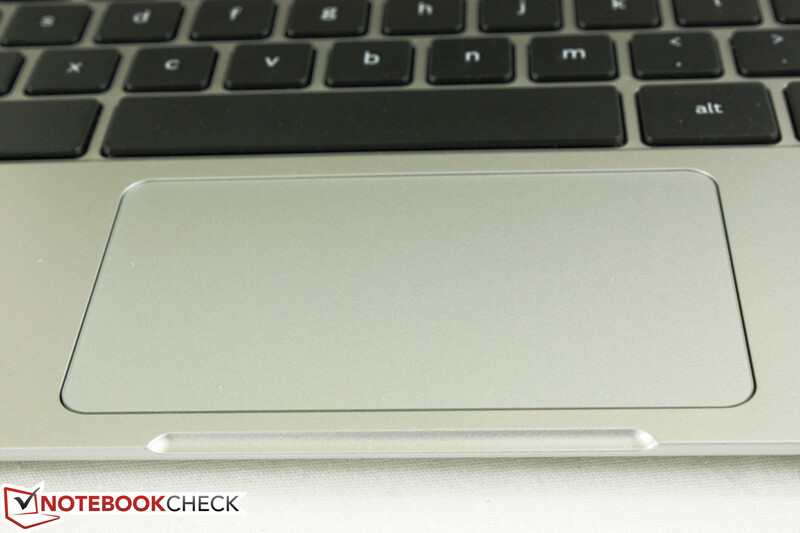 The case material is all plastic with average rigidity and can feel quite thin in certain areas. 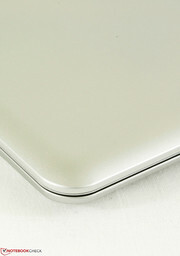 The palm rests, for example, can warp visibly from pressure and so do the center of the keyboard and the outer lid. Side-to-side twisting of the base and display is possible as well, but fortunately none of these imperfections are major enough to interfere with typical day-to-day usage. For children who may be less careful, however, expect a dent or two down the line. 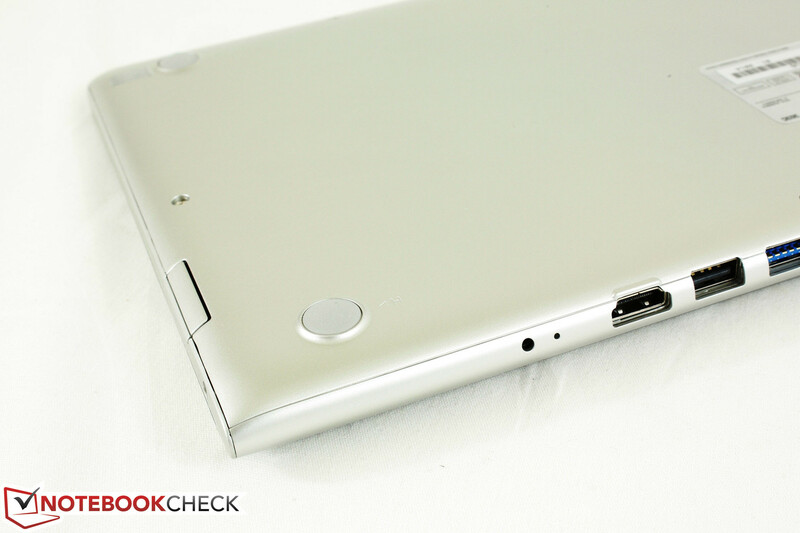 The simple chassis and small size have the biggest advantage of offering a lightweight notebook. At just 1.1 kg (2.4 pounds), the Samsung is lighter than the Pavilion 14, Acer C720, Google Pixel and both Series 5 models. Of course, the physically smaller screen size of the model in review more than likely contributes to this weight advantage, but it certainly shows how transportable and fit for traveling the Chromebook family can be. 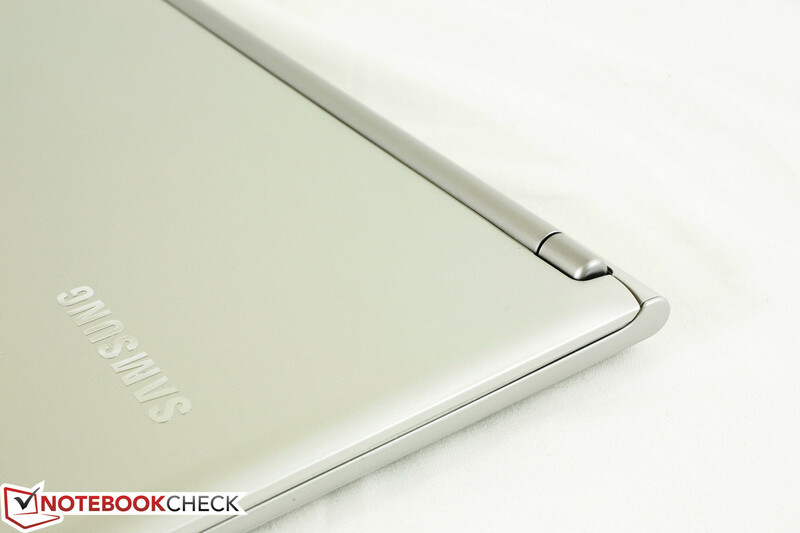 Visually, the matte and smooth silver surface make the notebook easy on the eyes without any flashy styling or glossy reflections save from the Samsung logo on the outer lid. The uniform color and rounded edges and corners distance the Chromebook from the professional looks of the more boxy ThinkPads and Latitudes, which seems appropriate for the target audience and price range. When considering these two factors, we find the chassis to be suitable for light use. Compared to the Series 5 Chromebooks, this 11.6-inch model has removed both the Ethernet and DisplayPort ports in favor of an HDMI port. The former is likely a cost-saving measure and latter switch to HDMI may be because of its wider reach and direct compatibility with more external monitors compared to DisplayPort. The model still retains 2x USB ports, one of which is USB 3.0 for devices that can take advantage of the faster speeds. Port placement makes it easy to reach what is needed, but it would have been nice to have one USB port on either the left or right-hand side for even quicker access. We connected an external 1920 x 1200 monitor to test the operability of the HDMI port. 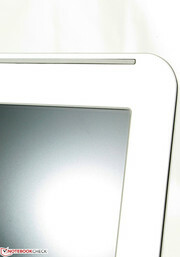 The notebook recognized the connection instantly and automatically outputted to the display, albeit it will only support a resolution up to 1920 x 1080. 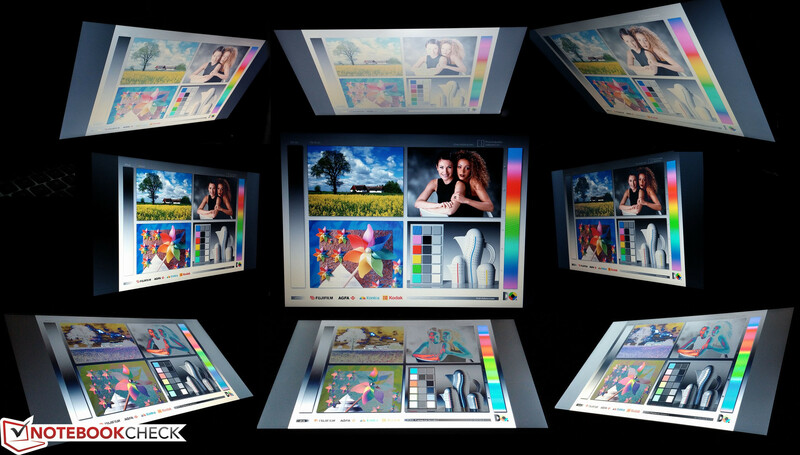 Unlike our previously tested notebooks, this model automatically extends the desktop instead of simply mirroring it. In case if users wanted otherwise, the notifications bar now alerts the user of the external connection and provides quick options to mirror, orient or even make alignment adjustments as needed. The lack of an RJ-45 port means that users will be relying on wireless solutions if dongles are not available. Fortunately, the model offers wireless-n and SIM support with Verizon, although the latter option is only available on the more expensive model with 3G support. We had no stability issues when connecting to a standard home WLAN network. 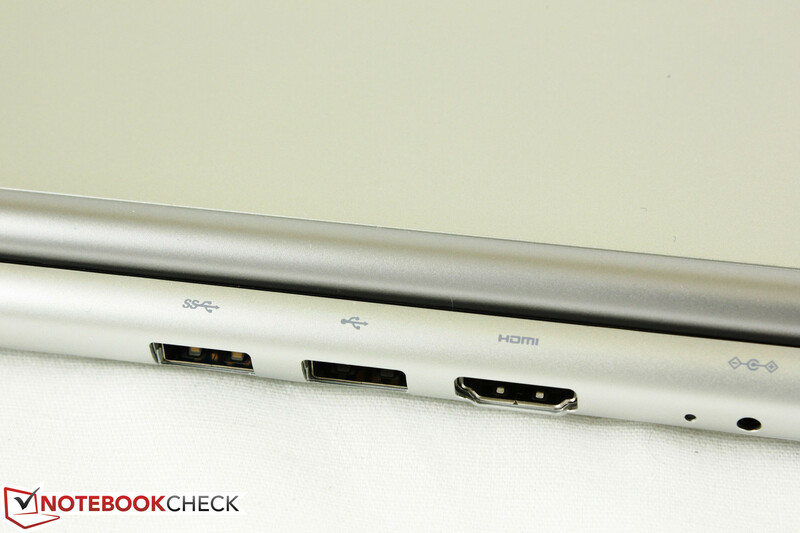 The focus on portability and lack of a docking port lead to no major accessories for the Chromebook beyond generic USB docks or other devices. 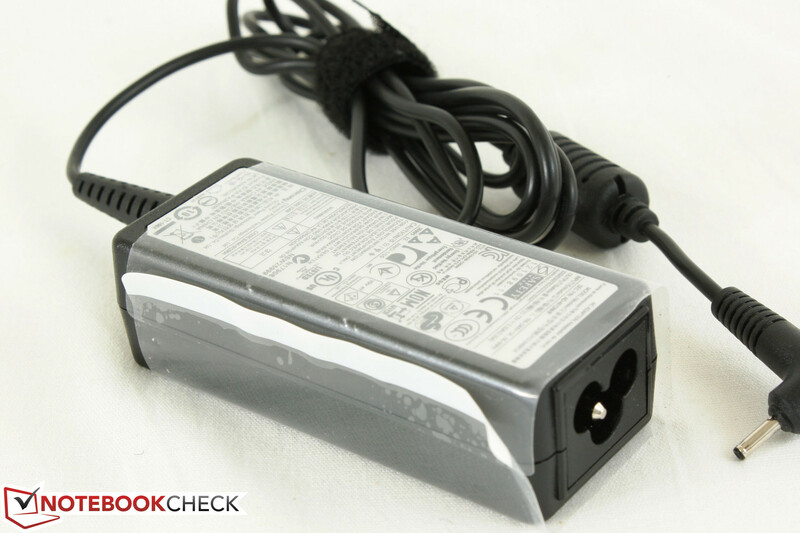 The standard 12-month warranty applies in the U.S.. The Chiclet keyboard (28.0 x 11.0 cm) is the basic Chromebook fare with lowercase letters and no Function keys or numpad for simplicity. 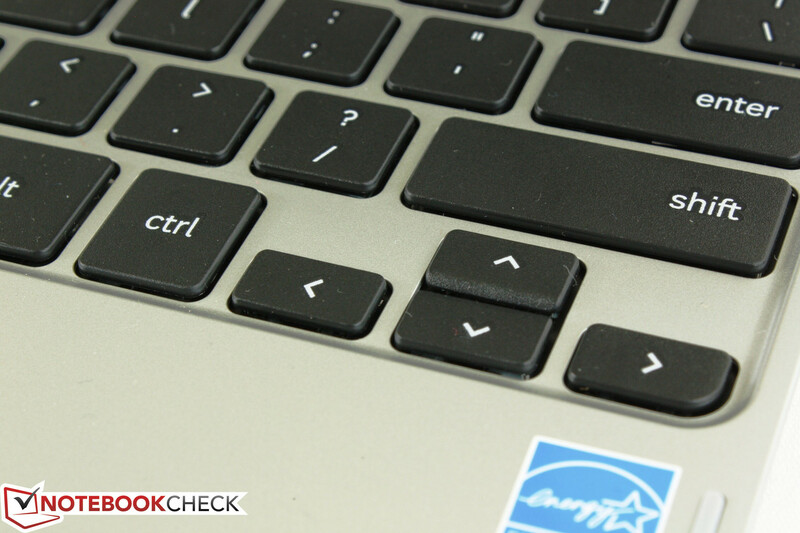 The top row of keys provide very useful inputs like brightness, volume, refresh and full screen that we wish all notebooks could include as dedicated keys. A gripe we have with the set up, however, is the large power key and its close proximity to the 'Backspace' key. Fast typists may find themselves signing out of their current account by accident instead of deleting those last few letters in their schoolwork or document. 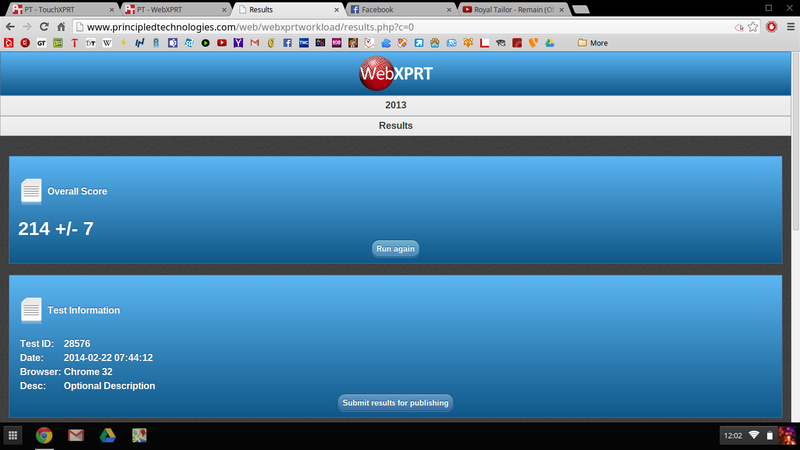 The small Arrow keys continue to be a disappointment, especially for a notebook heavily revolved around web browsing. In terms of usability, the keys provide shallow travel with relatively soft feedback that can feel very similar to the keyboards of Samsung's premiere Series 9 notebooks. Thus, users who are accustomed to desktop or beveled keyboards may need some time to feel comfortable with the lighter keys of the small Chromebook. 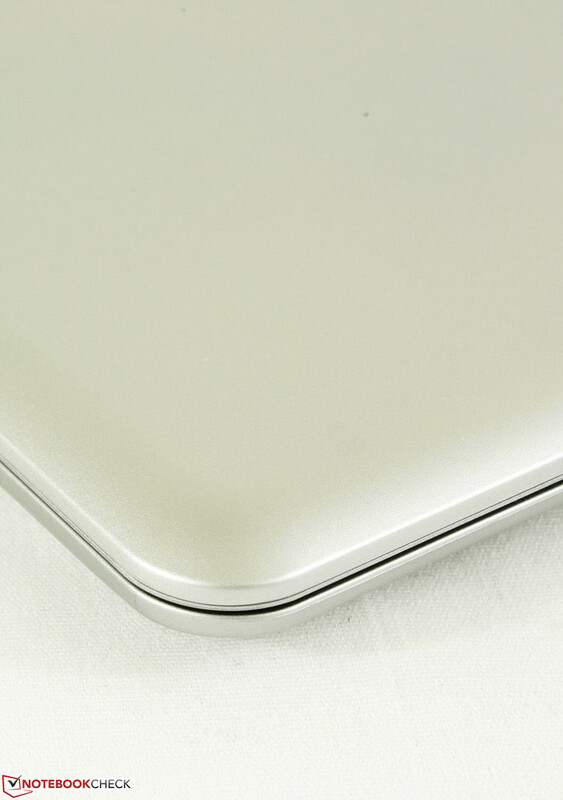 The touchpad surface is on the large side (10.0 x 5.5 cm) for an 11.6-inch notebook and is almost twice as wide as it is tall. It is still a bit smaller than the touchpad on the larger Series 5 Chromebook, but the proportion is perfect for widescreen displays and much more appropriate than smaller and more square-shaped touchpads found on larger gaming notebooks. The surface texture itself is the same as the surrounding chassis and inputs are registered reliably with no latency issues. Limited multi-touch is supported, such as 'back' and 'forward' commands by swiping left or right with two fingers or right-clicking by clicking with two fingers. The common multi-touch input for zooming is not enabled by default. Clicking anywhere on the pad will register as a left click, which is counter intuitive compared to common Windows notebooks. 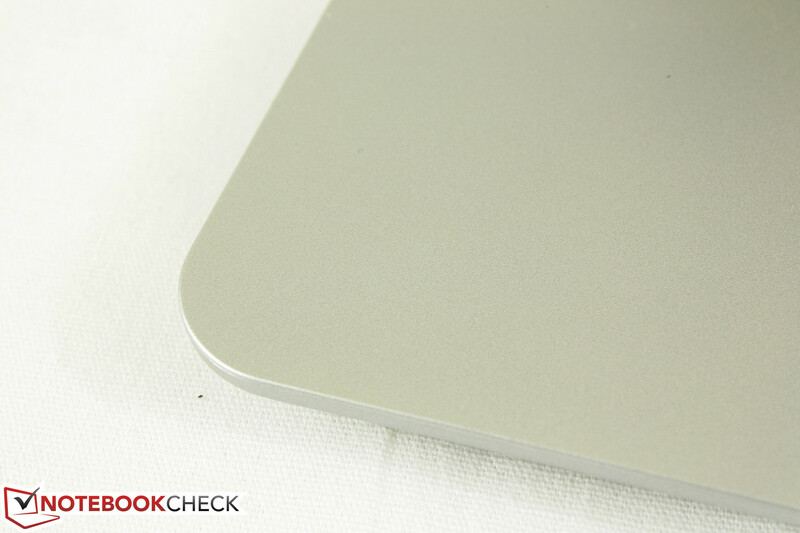 Though the click is shallow, it provides solid feedback and an audible sound. 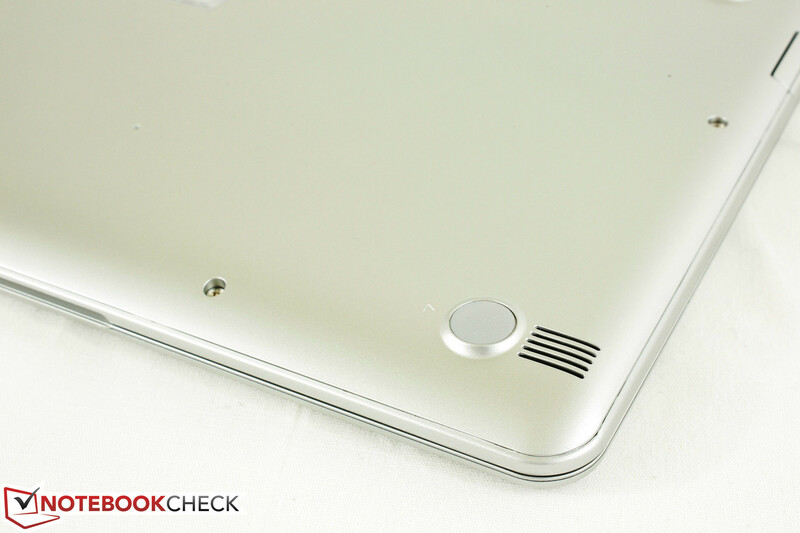 Overall, the size and feel of the touchpad would certainly fit in a notebook class more expensive than a Chromebook. The common 1366 x 768 pixel resolution is expected for a notebook in this size and price range. 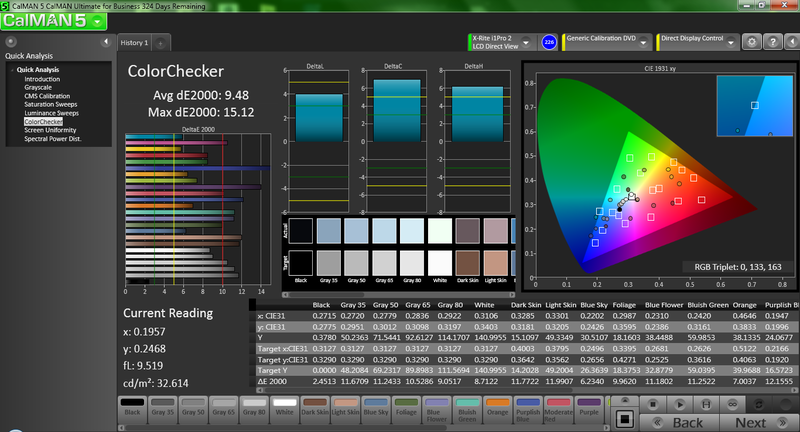 Colors and texts display without any obvious issues on the matte screen. 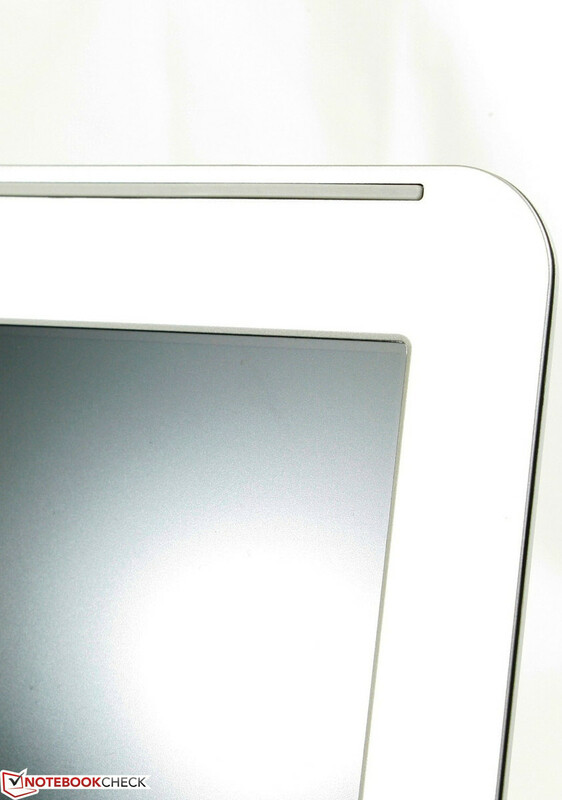 Some users may notice a slight screen-door effect even from a normal viewing distance, but this is common amongst budget displays. 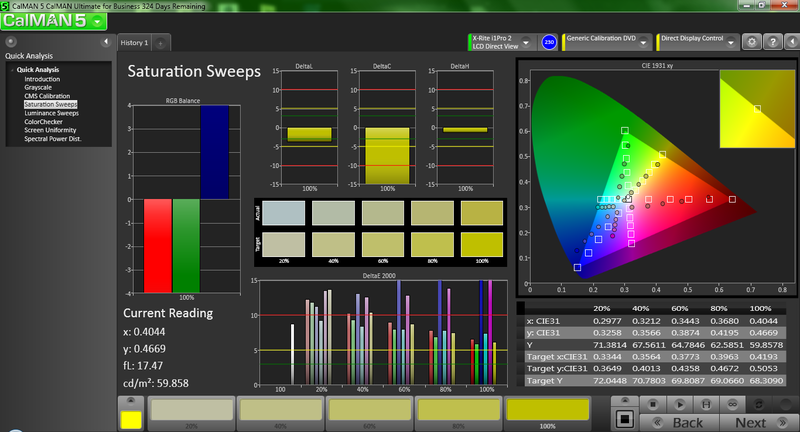 Samsung rates the display for a brightness of 200 nits, which we can confirm with our own measurements. This is sufficient for indoor environments where 150 nits or less can still be comfortable. Contrast is unimpressive at about 300:1, but still sufficient for occasional videos. 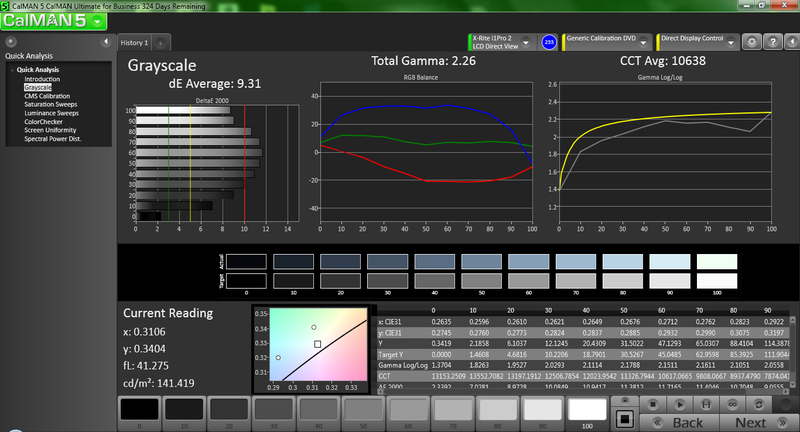 Further color analyses with an X-Rite i1Pro Basic 2 spectrophotometer reveal a poor grayscale and a cool color temperature. Blue and magenta are represented the worst compared to red, green and yellow on all saturation levels. To the target audience, however, such inaccuracies will likely not be significant to the work involved or even noticeable in everyday use. Outdoor usability is limited due to the average screen brightness. Even at the maximum brightness level, texts and images can become difficult to read unless if under shade. On the bright side, maximum brightness will not artificially drop if running on batteries. Viewing angle stability is the typical TN panel fare. Colors will degrade if viewing from below the normal much more quickly than from the sides or from the top. This can make the already small screen a bit more difficult to share with other viewers, but should not be an issue for the sole user. 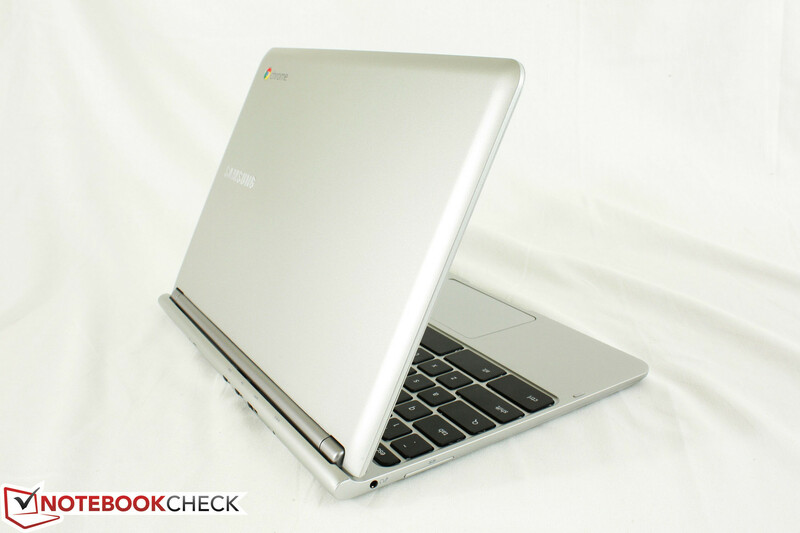 The Samsung Series 3 Chromebook is equipped with a 1.7 GHz Exynos 5250 Dual SoC consisting of two Cortex A-15 cores and a Mali-T604 GPU. This is the same SoC that powers the Google Nexus 10 and, as a result, shows similar performance between the Chromebook and the tablet. The software overhead due to the differing operating systems, however, may not be the same. 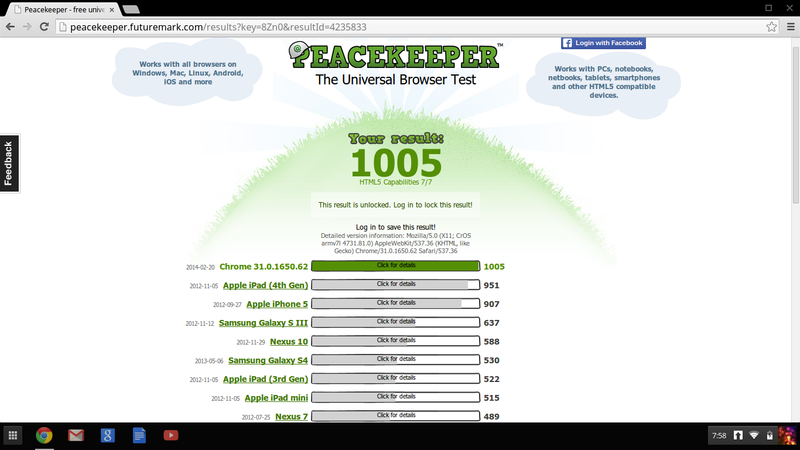 More benchmarks and results on both the CPU and GPU can be found in our Nexus 10 review. 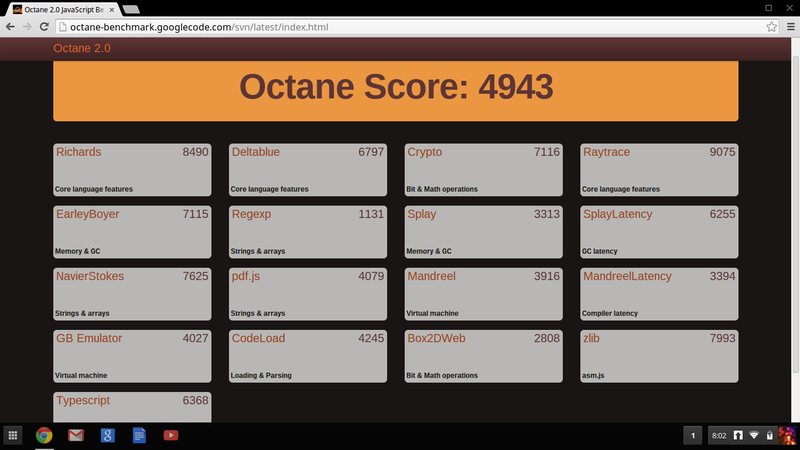 The 2 GB RAM feels just right for a Chromebook. Multi-tasking between browsing, word processing and active videos is effortless and surprisingly smooth for a notebook at this price range. The simplicity of the Chrome OS software adds a natural, no frills feel to the user experience. 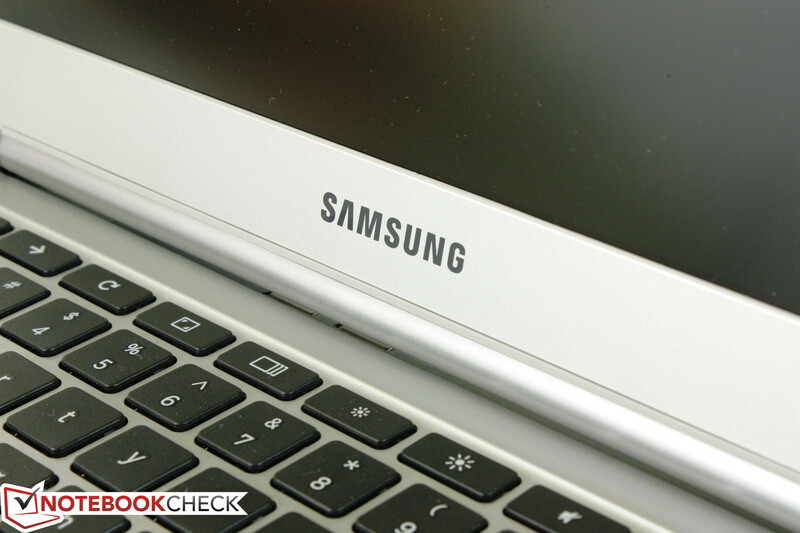 Synthetic benchmarks such as Sunspider and Peacekeeper show that the Samsung Chromebook is similar in performance to competing Chromebooks, although the ULV 1.4 GHz Celeron 2955U in the Acer C720 edges out the Exynos SoC by a notable margin. The expensive Google Pixel and its Core i5-3427U CPU is still king and in a league of its own. Subjectively, we found no slowdown or latency issues with moderate multi-tasking or 1080p Youtube playback. We played a 1080p video with a bitrate of ~16000 kbits/s from a USB source without any issues, but a 1080p video with a higher bitrate of ~40000 kbits/s will stutter enough to be unwatchable. 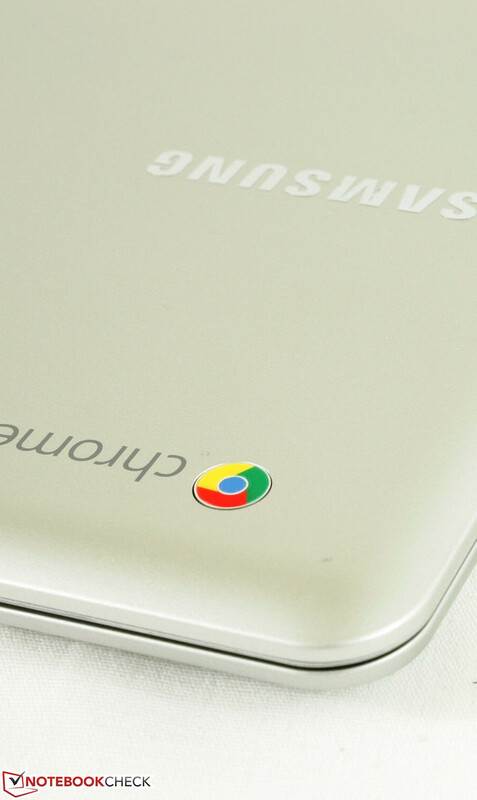 Like other budget Chromebooks currently in the market, the Series 3 Chromebook includes a small 16 GB internal SSD. While users will undoubtedly lament the limited storage size, it also encourages said users to utilize other storage solutions including USB drives and cloud services. This is also an advantage from a security standpoint as valuable data will less likely be stored locally. Still, we would have liked at least 32 GB of internal storage to fit more music and movies and expand the notebook to be a more multimedia-capable device. If Internet connectivity becomes unavailable due to location reasons, a larger local SSD would do wonders. 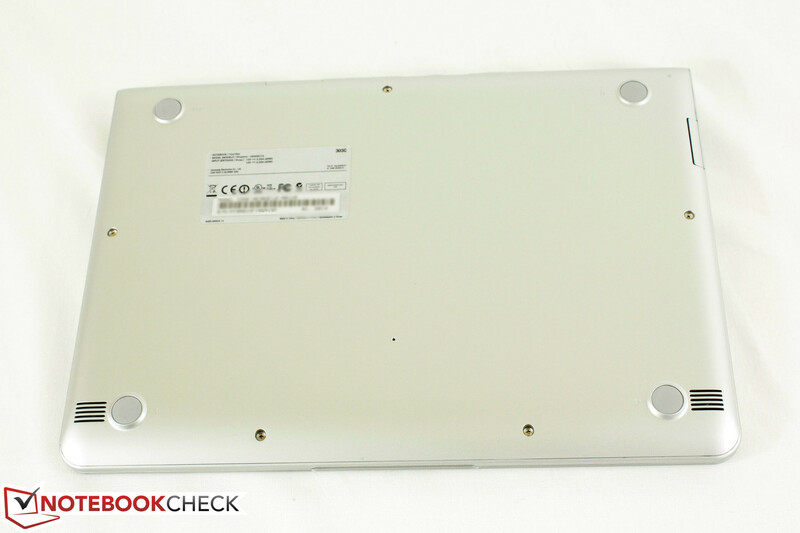 Similar to HP's recent Chromebook, the Series 3 Chromebook is fanless. The system is noiseless with no accompanying vent grilles due to the lack of active ventilation. Idling temperatures average about 25 degrees C on both the bottom and keyboard surfaces in a room temperature of almost 21 degrees. Temperature is uniform with no obvious hot spots. Under high loads reproduced by multiple 1080p YouTube videos set on repeat, a significant change in surface temperature can be recorded on the rear of the notebook. Meanwhile, the quadrants closer to the user and the keyboard remain relatively cool in comparison, which should allow comfortable use even under heavy processing loads. The Series 3 Chromebook compares favorably to many other Chromebooks including the Pavilion 14 and the Series 5 550C22 despite having no system fans. (+) The average temperature for the upper side under maximal load is 30.7 °C / 87 F, compared to the average of 29.8 °C / 86 F for the devices in the class Netbook. (+) The maximum temperature on the upper side is 37.4 °C / 99 F, compared to the average of 33 °C / 91 F, ranging from 21.6 to 53.2 °C for the class Netbook. (+) In idle usage, the average temperature for the upper side is 24.7 °C / 76 F, compared to the device average of 29.8 °C / 86 F.
The dual 1.5 W speakers are located on the underside of the Chromebook nearest the two front corners. The reside under the only grilles on the chassis. Sound quality is quite good for the size and especially the price. Bass is lacking, of course, but music feels otherwise balanced and without any static or artifacts at higher volume. However, Chrome OS offers no equilizer options by default and is instead limited to just volume and mute. 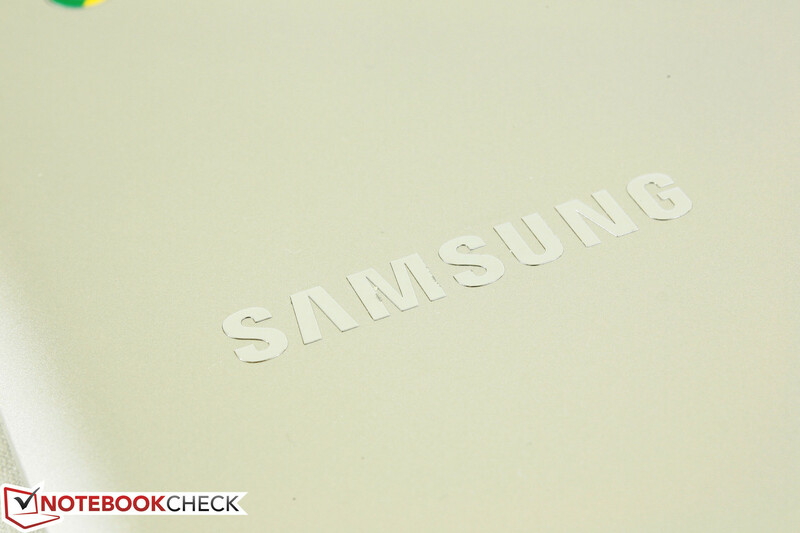 Samsung promises a battery life of up to 6.3 hours from the 2-cell 4080 mAh (30 Wh) non-removable Li-Polymer battery. 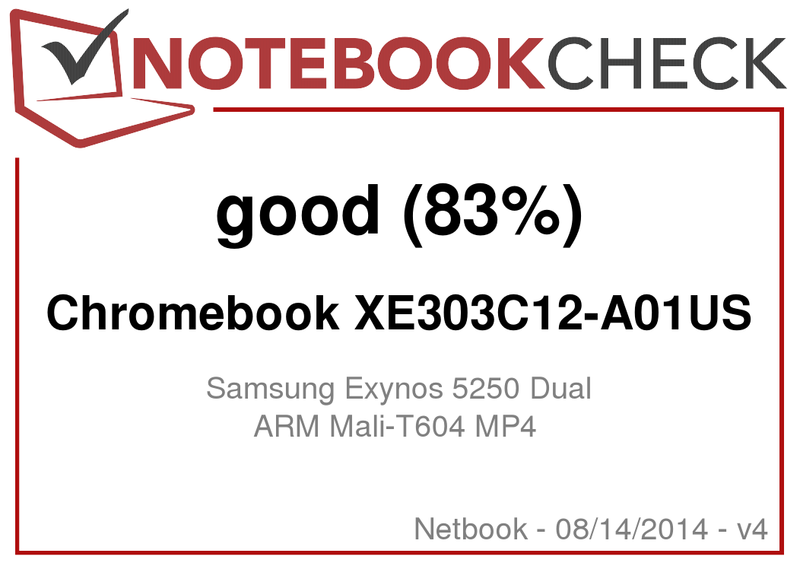 Unfortunately, we were only able to replicate a close runtime by allowing the Chromebook to sit idle with disabled wireless and at minimum brightness - hardly an optimum setting. Instead, users should expect about 4 hours of continuous use according to our WLAN test at 150 nits (brightness setting 13/16) and our looping browser script to simulate typical browsing conditions. The smaller battery capacity here compared to Samsung's Series 5 Chromebooks lead to lower runtime numbers for the Series 3 model. The Samsung 550C22, for example, clocks in at about 7 hours in the same WLAN test. 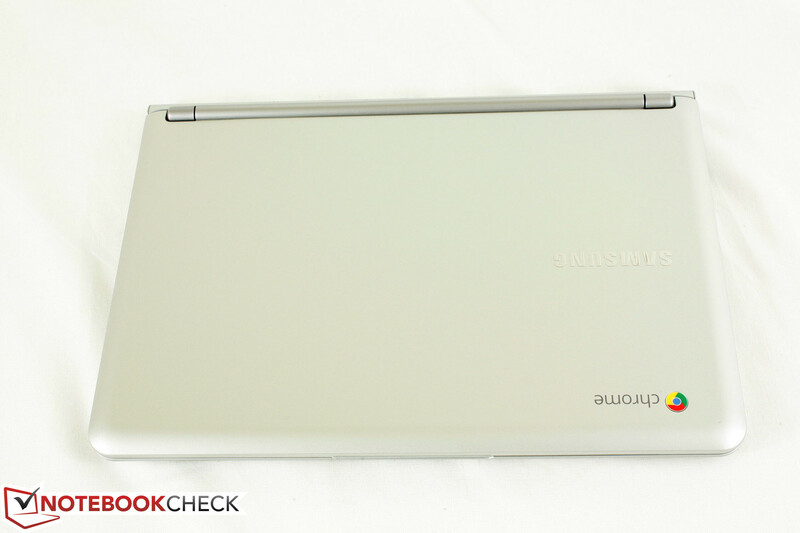 The 11.6-inch Samsung falls somewhat short compared to the Pavilion 14 and Acer C720 Chromebooks as well, which lasted for about 9 hours and 4 hours, respectively, in the same WLAN test. 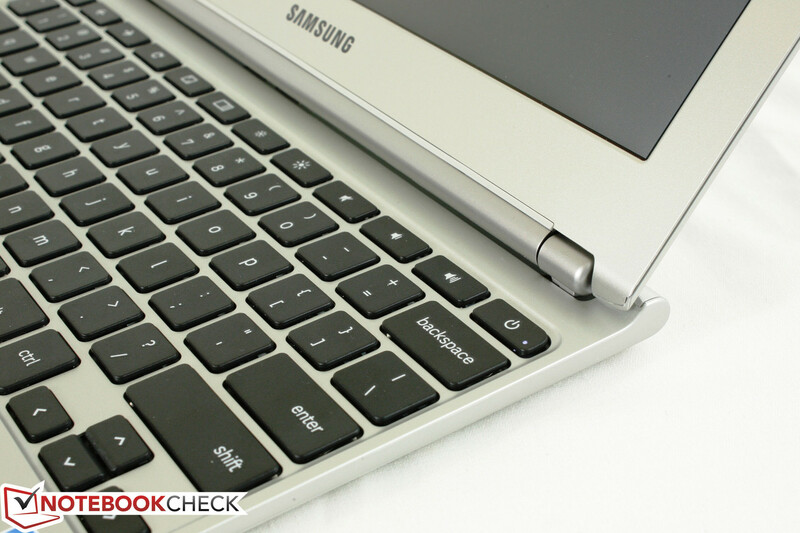 On its surface, the Samsung XE303C12 Chromebook sounds like a fantastic deal for just $250. The notebook is powerful enough for simple multi-tasking and tasks like web browsing, video playback and word processing while being small and portable enough to be considered a travel companion. The low price and reliance on cloud-based storage also make the Chromebook an excellent secondary notebook for schoolwork or light office work and can even be considered disposable - at least as far as notebooks are concerned. All the limitations of a Chromebook continue to apply. Potential buyers must keep in mind that Chrome OS is not compatible with Windows or Mac software or even apps and games from Google's own Play Store. Instead, users are largely limited to the Google Chrome Web Store, which can be either hit or miss in terms of content and options. 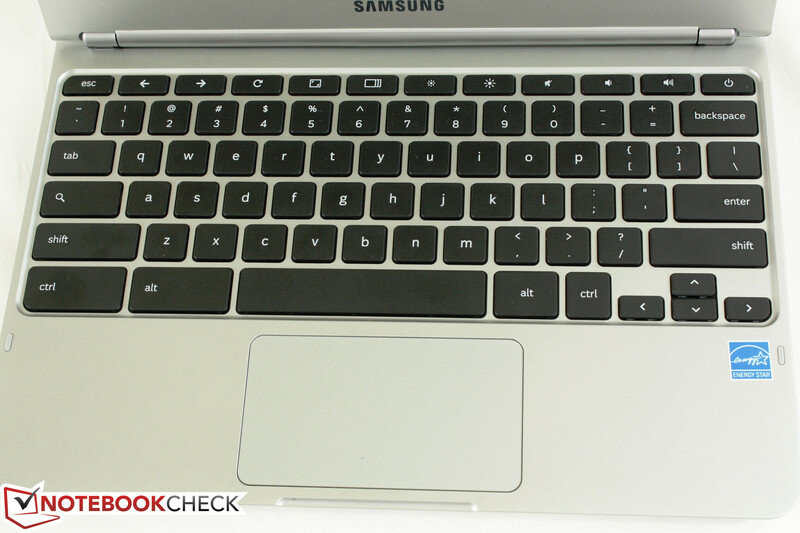 Do we recommend this Samsung model over competing Chromebooks? At $250 apiece, the similarly sized HP Chromebook 11 and Acer C720 all have so much in common that it can be hard to distinguish between one or the other. The HP has the brighter screen but lacks a dedicated HDMI, while the Acer has the more powerful processor but does not utilize a fanless design. The Samsung runs cooler than both the HP and Acer, but has a generally shorter battery life as well. 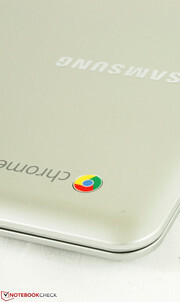 Ultimately, users should pick the Chromebook that best fits their outdoor or indoor lifestyle and workloads. Inexpensive, easy-to-use and no frills notebook for anyone to use. Longer battery life and a dedicated RJ-45 port. 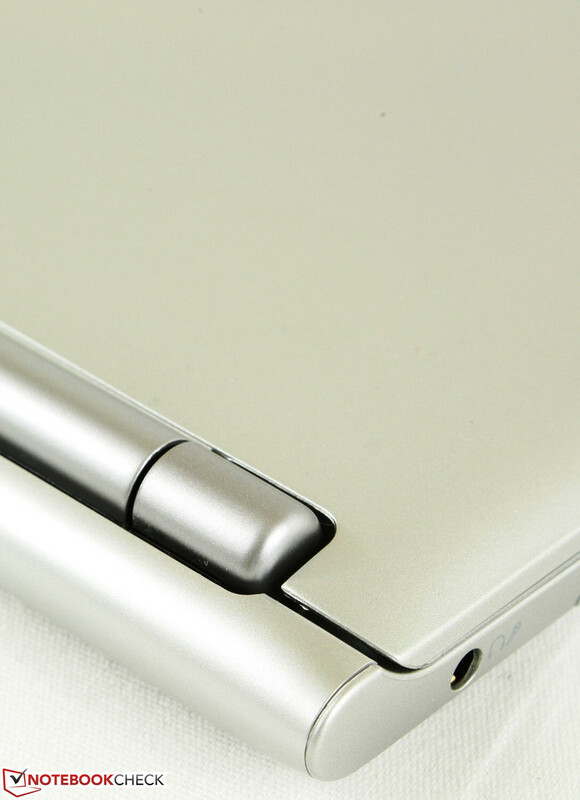 A larger internal SSD would greatly increase the media capabilities of the notebook. A very capable Chromebook fit for traveling for just $250. Speakers are also good for the size and price.